A dog’s ear is very tender, especially when infected. It makes sense to know how to examine your dog’s ears, what to look for, and how to prevent infections. This article teaches you how to spot problems before they become serious and how to clean the ears routinely. When in doubt or if an infection is present, a visit to the veterinarian is in order. 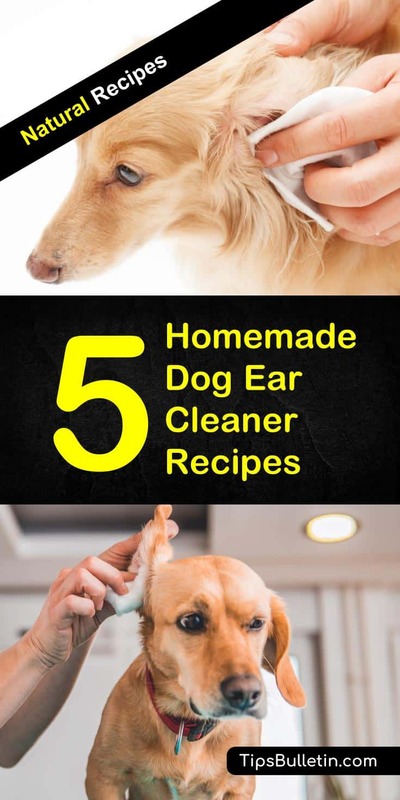 I’m going to tell you how to clean your dog’s ears and give you the best homemade dog ear cleaner recipes so that you can take care of your dog’s ears properly. I’ll show you how to make ear drops for dogs to take care of minor issues and tell you how to know when professional help is needed. To keep your dog safe and healthy, you should inspect your dog’s ears and clean them weekly. Inspect the ear for signs of dirt, irritation, infections or parasites. Redness or irritation could be minor, or it could signal the beginning of an infection. Watch it closely. If you detect any signs of an infection, see a veterinarian immediately. Clean only the external parts of the ear. Do not use a cotton-tipped stick or anything else inside the dog’s ear. Start with a cotton ball and wet it with our homemade dog ear cleaning solution. Wipe the outside of the ear and the parts inside of the ear that you can see and reach on the outer flap. Wipe the inner ear with a new cotton ball and cleaning solution. Do not put any cotton into the ear canal. Place a dropper full of the homemade ear cleaner for dogs into the dog’s ears and give your pet a gentle massage at the base of the ears. After a minute let him shake it out. Shaking will loosen ear wax and other debris inside the ear. Use a clean, dry cotton ball to wipe it out of the ear. Repeat the drops and wiping as needed until no more wax comes out. Then give your pup hugs and a treat, he’s earned it. This vinegar solution works to not only clean the ear, but it also adjusts the pH within the ear so that yeast, fungus, and bacterial infections cannot grow. Use it to clean the ears of dogs who have frequent infections. Use apple cider vinegar or distilled white vinegar for this recipe. Hydrogen peroxide is a natural disinfectant. It destroys the cell wall of bacteria, but it can also damage the dogs ear tissue if used too often or too strong. Use this wash after infections or as directed by your veterinarian. Use only the 3% hydrogen peroxide found in the drug store for this recipe, not the higher concentrations used for industrial applications. 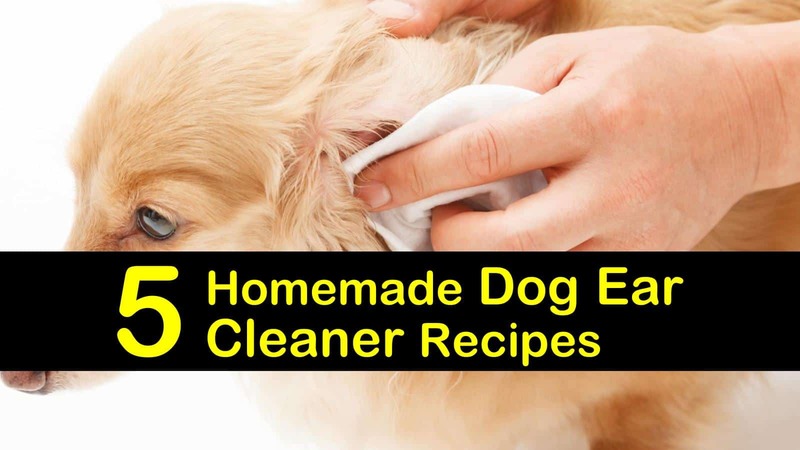 This recipe kills bacteria and fungus while cleaning your dog’s ears. To make it, mix the boric acid and vinegar until the boric acid is dissolved, then add the rubbing alcohol and povidone-iodine. The povidone-iodine helps kill bacteria, but it also stains everything brown, so if your dog’s fur is white you might want to omit it. If your dog is prone to ear mites, clean her ears with witch hazel. It flushes out the dirt while killing the ear mites that are so problematic. Witch hazel is soothing on the irritated ears and dries quickly. You can use lavender or other essential oils in this recipe, but I prefer to use tea tree oil, especially for dogs recovering from ear infections or prone to irritations. The tea tree oil which is also a natural tick reppellent, has antifungal properties that are effective at eradicating yeast and fungal infections. No matter which oil you choose, it must be diluted with a carrier oil such as olive oil. Mix the oils well before use. consult with your veterinarian first! It is important to prepare everything before you start the process of cleaning your dog’s ears. My dogs do not like to have their ears cleaned, so I make sure I give plenty of affection during the process. The ear tends to become a moving target if I take too long, so I try to be ready and get it done very quickly. It is easier if you start training them for the process as a young pup. I hope that I have given you all the information you need about how to make homemade ear drops for dogs. Keeping the ears clean and healthy is so important to our canine friends. If you have a different method that works for you, I hope you’ll let us know. And please share this article with your friends and family. The more we know, the better care we can provide for our beloved pups.